Let us out of the jar, the store, the parking lot, the town. We’re packed in tight from a contract entered on our behalf, when we had words but no voice. There has to be room to grow once you’re fully grown; there has to be a means to move beyond what we’ve all expected from mobility. Many are thinking it but we have the mouths to speak it. There is a place to go that is not on the map we were given. A place that was in its glory well before our labels were typed and slapped on our proverbial jars. That place is called Wherever I May Wander. The means is called My Mind’s Full Tank of Gas. We’ve seen enough people walking by. Haven’t you? We’ve seen the same snake. Not the animal, but the incessant trail that’s walked, hiked and trudged that’s been accepted to define our path. We say, defy the snake. Let us out, twist our lid, crack our door, look the other way. Let us rely on ourselves, our means, our abilities. If you’re brave you’ll look directly in our eyes as we go that way. We don’t march to burn. We march to go. We don’t take what’s yours. We extend what’s ours. What do I have to offer the world? How unique is it, what’s its value, who wants to buy it? Don’t we need to define that for ourselves? Some of us can’t go. They’ll be satisfied to dream; that’s their travelling too. They can’t walk, their ties are what define them. We bow to them. Let us out, and with that, we welcome you in. 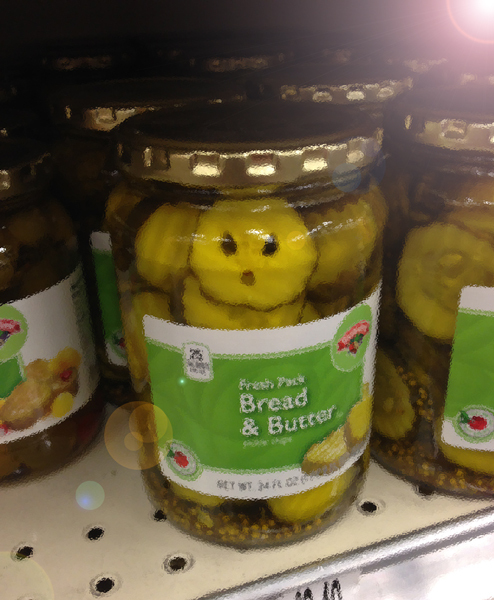 ARTIST’S NOTE: A pickle slice’s take on the desire to find a new life. Our protagonist challenges his peers and his gatekeepers, urging them to explore the world however they can, by “defying the snake”, that is, by breaking away from the snaking path of the grocery store aisle, a route that reeks of mindlessness and sameness.